Picture it…. Sicily. Cannoli, the singular being cannolo, is said to have originated in Palermo, Sicily during the Arab rule of Caltanisseta. Some say that the dessert makers created these out of resemblance of their Sultan. Others say it was a fertility symbol created for Carnivale. Either way, they are absolutely delicious! We’ll eat to that, right?! 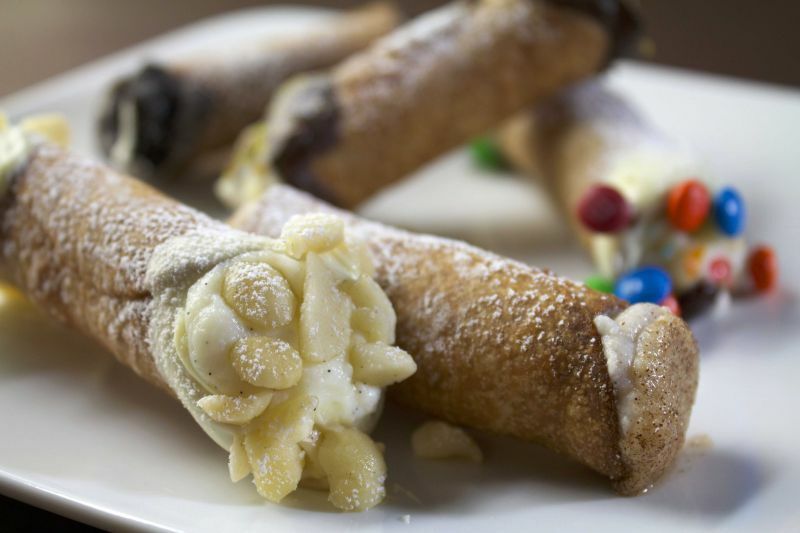 Traditionally, cannoli are crispy, tube-shaped shells filled with a savory or sweetened cream. Ricotta or mascarpone are the general suspects of the filling. The shells. Ohhhhhh, the shells. These crispy treats are the reason why I love cannoli so much! I enjoy sweet desserts, but cannoli are usually quite low in sugar content (although, you can change that as you see fit). There is something delightful about a crispy, shaped shell with a sweet filling. 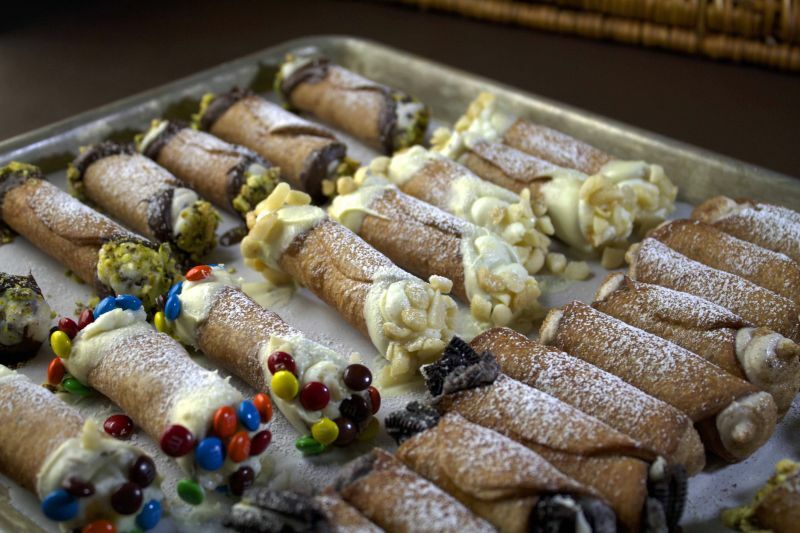 Cannoli shells are made best with a splash of marsala wine, also a Sicilian gift to the world. Marsala adds a distinct, under-toned sweetness to the shell that just can’t be better mimicked with anything else. It is fairly inexpensive and very useful in the kitchen! Who doesn’t like Chicken Marsala for dinner? The trick to cannoli is in that light, thin, crispy magical shell. If you mess up the shell, well… then you might as well throw it all to hell. (Get it…?? Fine. I’ll stop.) Many will tell you that you need a cannoli mold to make them juuust right. While I do agree that this is the easiest way to shape the fried goodies, it is not the only way. I decided at make these (at 11pm, of course) before I had perfect stainless steel cannoli shell molds. At first, I thought, I’ll just roll foil tightly into a tube and fry the shells around that. How simple, right? WRONG. Maybe some (read: all) of you are craftier than I am and could make this work, but this just was an utter disaster for me. I ended up with a pile of broken shells stuck between the tiny ridges of the crunched foil tubes. Luckily, I was able to repurpose the shattered shells for ice cream topping, which I suppose is a win-win situation. But, still. Unless you are able to roll a perfectly smooth tube out of foil, I would try one of the other options. Dried cannelloni pasta supposedly works well, although I have not yet tried it. I had some large dowel rods laying around, so I got the idea to cut those into small pieces and try them. After all, families in Sicily have been passing down their broom stick pieces for years. They worked perfectly fine! I did end up buying steel tubes, because the shells slide off much easier and will likely have plenty of other baking uses, but until then I would recommend slicing up an old broomstick, steel hollow curtain rods that you threw into your attic after an impulsive remodel… anything you may have handy, really. Part of the fun of making cannoli are the endless options for what to accent them with. You can go sweet (which is obviously what I decided to do for this post) or even savory. There really isn’y anything better than cannoli and coffee in the morning… or afternoon… or middle of the night for that matter! For this post, I will focus on the sweet side. We’ll hit a few savory options another day. Also, a side note, cannoli are most certainly best when eaten right after they are filled. That is not to say they aren’t still amazingly delicious the next day, but they have a better crunch and array of textures before the shell has a chance to absorb any of the filling’s moisture. Keep the shells closed up and fill them when you are ready to serve. For the planner, unlike myself, the shells freeze surprisingly well. When you are making the dough, feel free to use your imagination. While tender care and precise measurement of any dough will always result in a better product, you can afford to make some changes with this recipe, if you wish. You can replace a couple tablespoons of the flour with cocoa, for instance, if you want a chocolate shell. You may find that by adjusting the dry ingredients in the dough that you will have to adjust the liquid as well to get a workable consistency. After I adjust the amount of Marsala in my glass, I just adjust the amount in the recipe too! The possibilities for the filling are endless. I decided to go all out and try tons of options to see what I liked the most for next time. I brought out the traditional pistachios and mini-chocolate chips, as well as macadamia nuts, various small candy pieces, white chocolate, cinnamon & sugar and cookies. Some of them I mixed in with the cream filling (eg: mini chocolate chips), some I just dipped the ends with. Some shells I dipped in chocolate, some I didn’t. You can really do anything that you want. Spoiler alert: ALL of them were amazing! Mix sifted dry ingredients in bowl. Add butter by cutting into dry mixture using fork or pastry cutter. Add and mix wine. Note that depending on the flour used, the amount may vary. Mix until dough forms together well and can mold into a ball. Let dough ball sit for at an hour in the refrigerator. It can sit for several hours or even overnight. 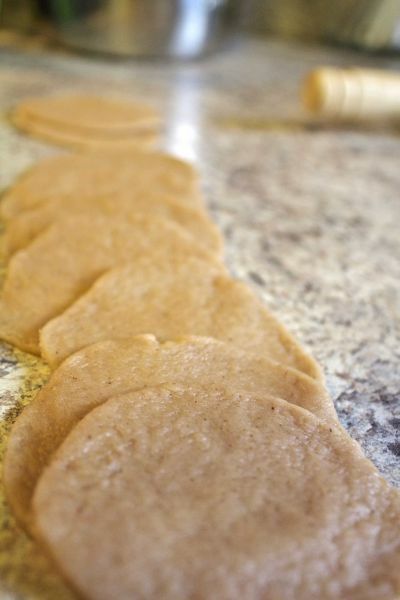 When chilled, remove and place on lightly-floured surface to cut. Roll out dough, turning after each roll to prevent sticking to surface, very thinly. The more thin, the more light and bubbly the shells will be. Cut out ~3½ inch circles or ovals. Using a floured rim of a glass will make this easier. Wrap circles around cannoli molds, allowing the ends to overlap and seal together to form the shell. Heat oil (preferably fresh canola oil) to 360 deg F.
Fry shells in oil until golden, about 2-3 minutes. Allow to cool slightly (1-2 minutes). Using tongs/kitchen towel, carefully slide shells from mold and allow to cool. Mix the drained ricotta or mascarpone with the sifted confectioners sugar, cinnamon and vanilla. For a fluffier filling, fold heavy cream that has been whipped into the mixture. 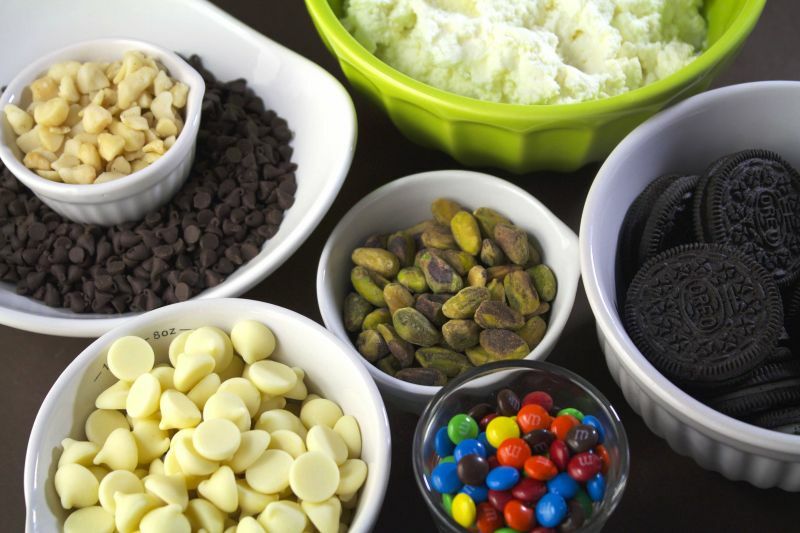 Mix in optional fillings (mini chocolate chips, crushed candy pieces, etc.) as you wish. Mini chocolate chips mixed into the filling, ends dipped in pistachios after filled is more traditional. Optionally, dip shells in melted chocolate and let cool. 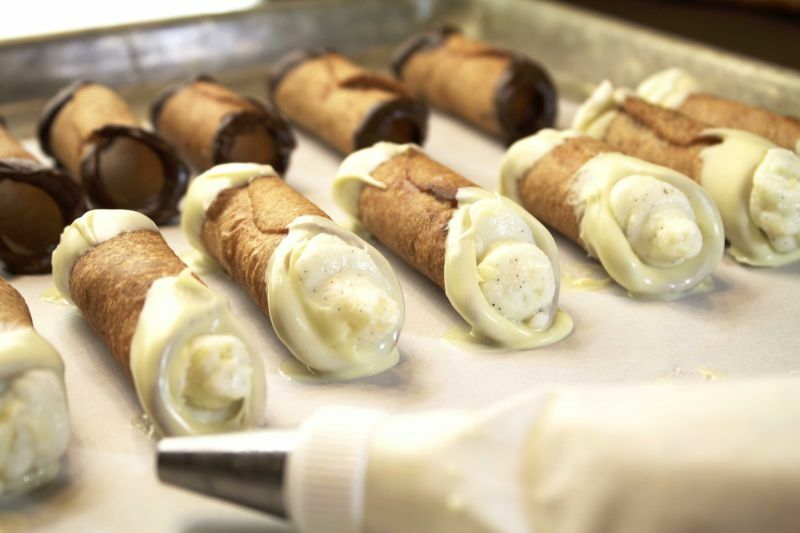 Take cooled cannoli shells and pipe in filling. Dip finished cannoli in toppings. 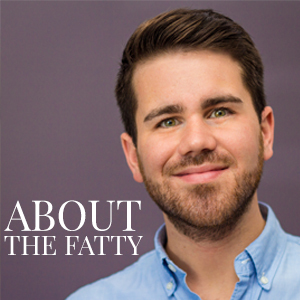 Visit SouthernFATTY.com and let us know how they are! SouthernFATTY.com | Nashville, TN based food blog. Loosen your bow tie, mint your julep & stop in for a bite to eat! 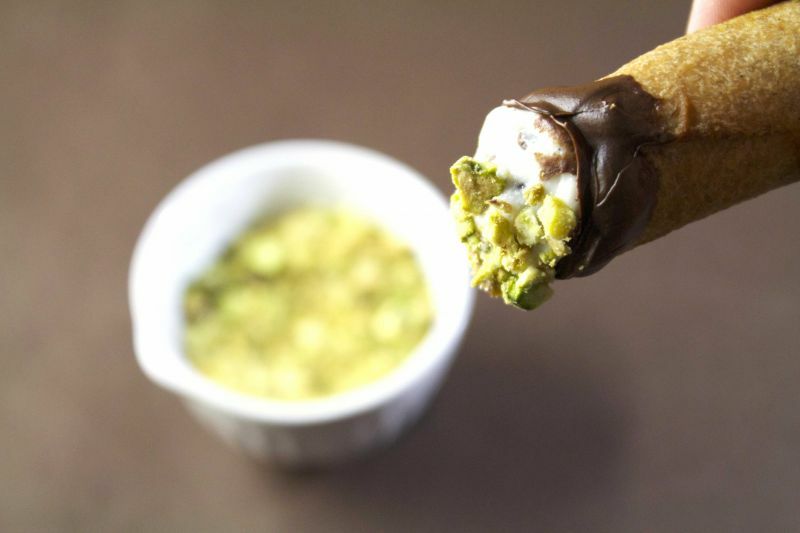 What other toppings will you make to go on your cannoli? Let us know! How divine and they look amazing! On my last trip to Sicily I still had to have one last cannoli at the airport. Next time, feel free to bring us back some! Sounds amazing. I hope to do that exact same thing in the future. Thanks for the compliment! You’re site is fantastic. We are certainly keeping an eye on what you have going on!